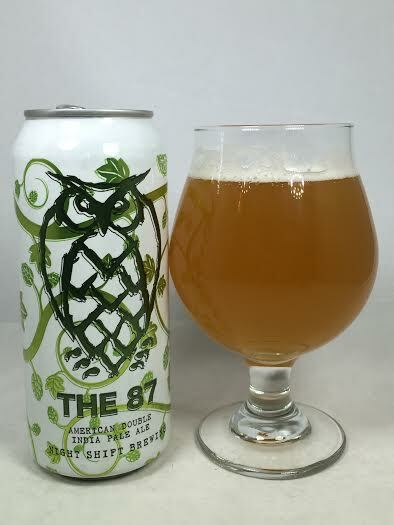 The 87 DIPA is named for the street number at which Night Shift Brewing resides and is a big, hop-driven Double IPA that is a self-described "hop bomb". It was initially released in bottles, but is now available in 4-packs of 16oz cans and appears to be part of the regular rotation of Night Shift beers. Pours a dirty, hazy dark orange with a finger of white head. The aroma is heavy on the hop oils and pure hop juice. There's a small amount of grapefruit acidity and a tinge of orange. The hop intensity is strong with this one. Much like the aroma that was swimming in hop oils, the taste is exactly the same. It's not what I'd typically call a "hop bite" as it isn't overwhelmingly bitter, but instead it's just pure hop juice. Imagine throwing a ton of hops into a blender and that is the experience I am getting. There's also a decent malt presence which adds a touch of sweetness and the subtle grapefruit from the aroma is here too to add a slight fruity component to take some edge off the hop oils. The finish has a small thud of lingering dankness and doesn't wuss out and finish too clean. Mouthfeel is full-bodied for the style. I will definitely say that this is not shy about being dry as a sip of water might come in handy with this one, but it doesn't take anything away from the taste and overall experience. It's not a calm feel by any means, but it is still not a challenge to put down. The 87 was promised to be a hop monster and it did not fail to impress in that aspect. An Imperial IPA with this much of a hop presence can sometimes come off as an explosion of bitterness, but this has found a way to squeeze all of the juices and oils from the hops without an excessive, bitter bite. Very drinkable for a big IPA and this has earned a spot in the regular rotation in my fridge.